Another AV8RSTUFF Creation: This is the "Black Eagles" squadron patch. 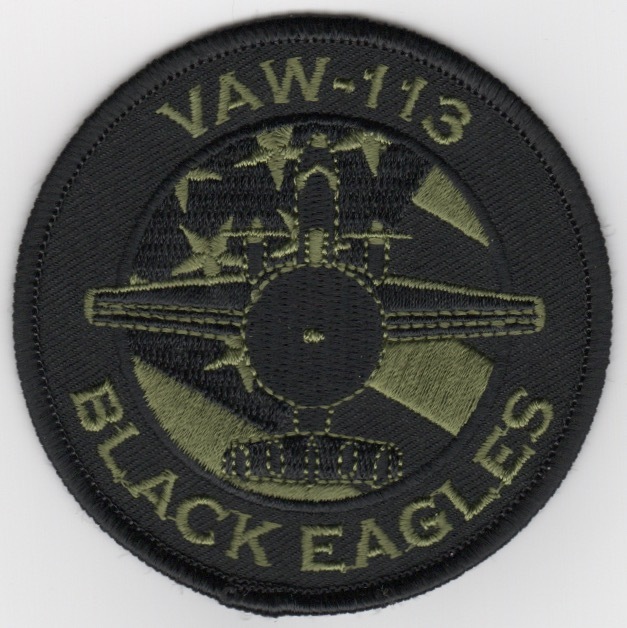 Carrier Airborne Early Warning Squadron 113 (VAW-113), known as "Black Eagles", was established on 20 April 1967 flying the E-2A Hawkeye. Check WIKIPEDIA for a very long and distinguished flying career for the squadron! In 2010, VAW-113 completed a work-up cycle which included the multinational RIMPAC 2010. In February 2011, the squadron deployed aboard the USS Ronald Reagan in support of Operation New Dawn in Iraq and Operation Enduring Freedom in Afghanistan. In March, during the transit across the Pacific, the squadron was called into action following the devastating 2011 Tohoku earthquake and tsunami in Japan. The squadron provided the airborne command of the relief effort using their Hawkeye 2000s in Operation Tomodachi. Commander of Naval Air Forces awarded the squadron with their tenth Battle ÒEÓ Award for their efforts. This patch does not come with velcro attached. 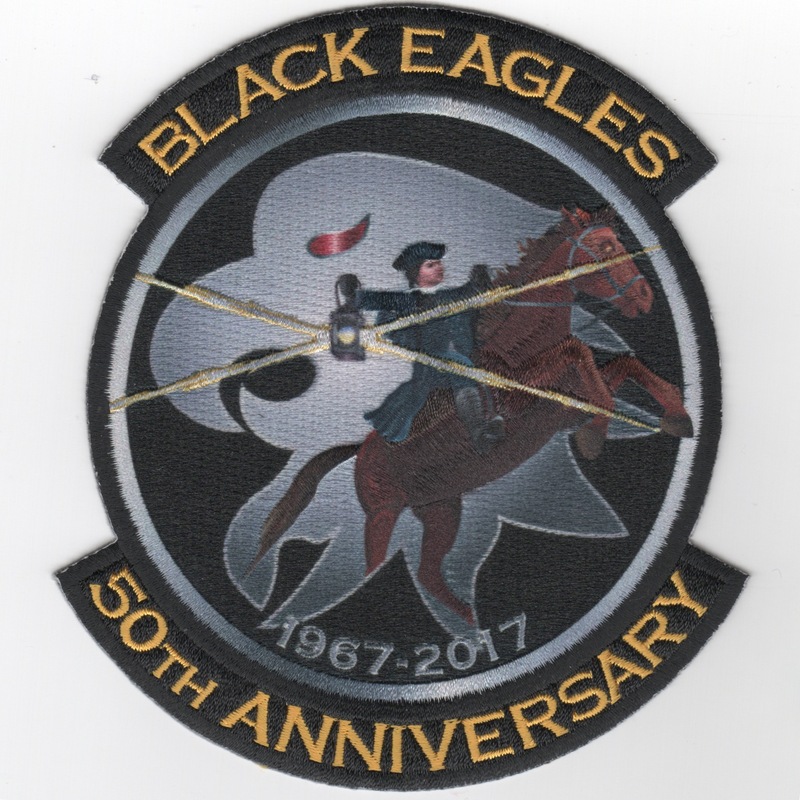 This is the "Black Eagles" 50th Anniversary commemorative patch they created using the new 'Hybrid' technology. It depicts Paul Revere with his "Lantern" on his famous ride doing his "early warning" of the British invasion. This is a "limited production" patch does not come with velcro attached, so get it while we have some in stock!! 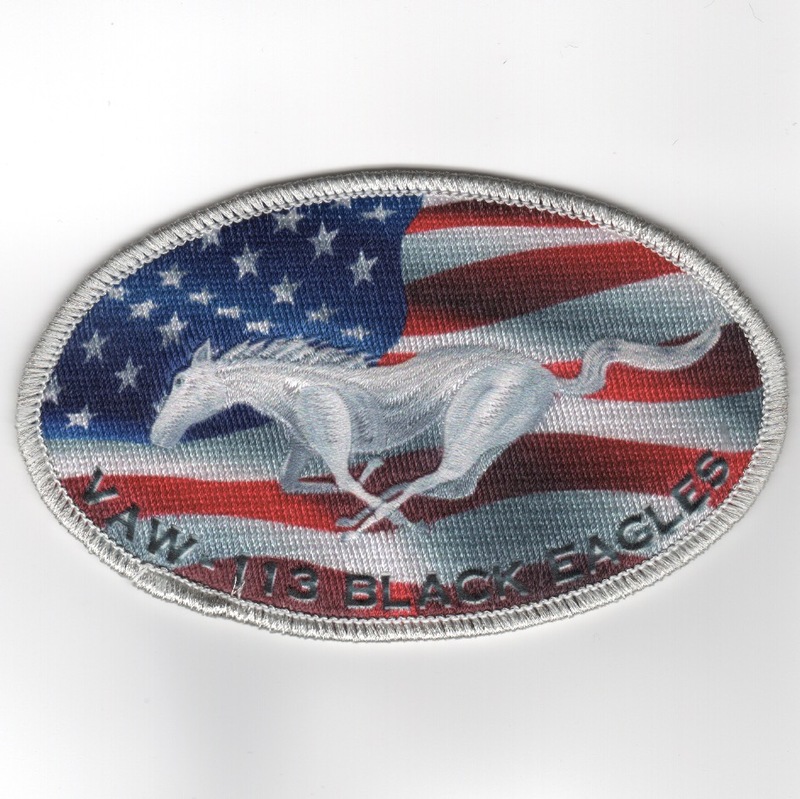 Another AV8RSTUFF Creation: This is the "MUSTANG" (Red/White/Blue) commemorative patch depicting a "White Horse" on a R/W/B background and says "VAW-113 BLACK EAGLES" along the bottom. This patch does not have velcro attached. Carrier Airborne Early Warning Squadron 113 (VAW-113), known as "Black Eagles", was established on 20 April 1967 flying the E-2A Hawkeye. One week after its establishment, VAW-113 deployed to the Western Pacific (WESTPAC) aboard USSÊConstellation and served in the Vietnam War from 1967 to 1975. The culmination of these efforts occurred in April 1975, when VAW-113 played a vital role in Operation Frequent Wind, the evacuation of American personnel from Saigon.....a long history for this squadron continuing even today! This is a commemorative patch for their squadron depicting the "CAG bird" Tailfin and does not come with velcro attached. 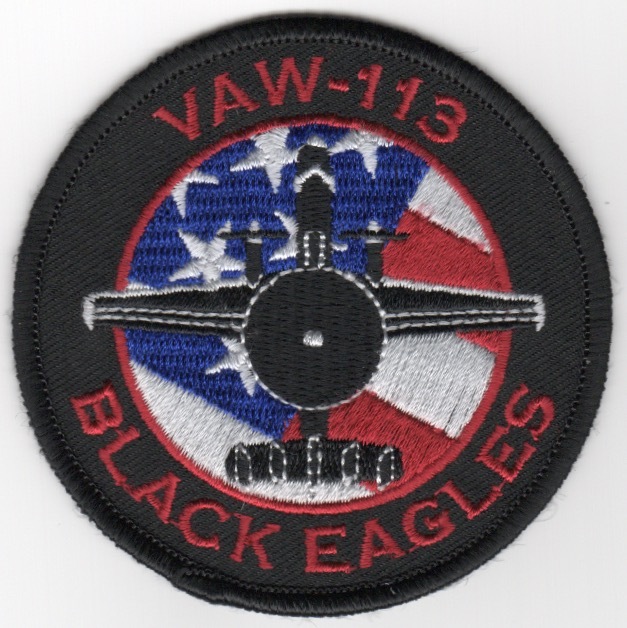 Carrier Airborne Early Warning Squadron 113 (VAW-113), known as "Black Eagles", was established on 20 April 1967 flying the E-2A Hawkeye. One week after its establishment, VAW-113 deployed to the Western Pacific (WESTPAC) aboard USSÊConstellation and served in the Vietnam War from 1967 to 1975. The culmination of these efforts occurred in April 1975, when VAW-113 played a vital role in Operation Frequent Wind, the evacuation of American personnel from Saigon.....a long history for this squadron continuing even today! 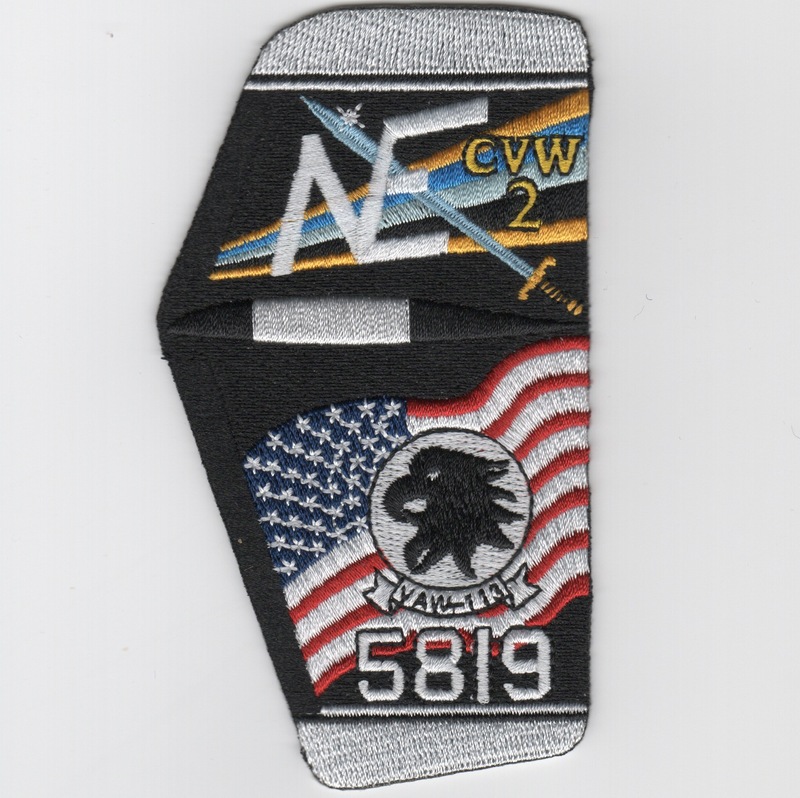 This is a commemorative patch for their squadron depicting the "CAG bird" Tailfin and does come with velcro attached. Another AV8RSTUFF Creation: This is the 'bullet' patch for the 'Black Eagles'. It depicts the E-2C Hawkeye planform on a red/white/blue background. This patch does not have velcro attached. Another AV8RSTUFF Creation: This is the 'bullet' patch for the 'Black Eagles'. It depicts the E-2C Hawkeye planform on an OD Green (subdued) background. This patch does not have velcro attached. Use this link to get both "BULLET" patches above at a discount. 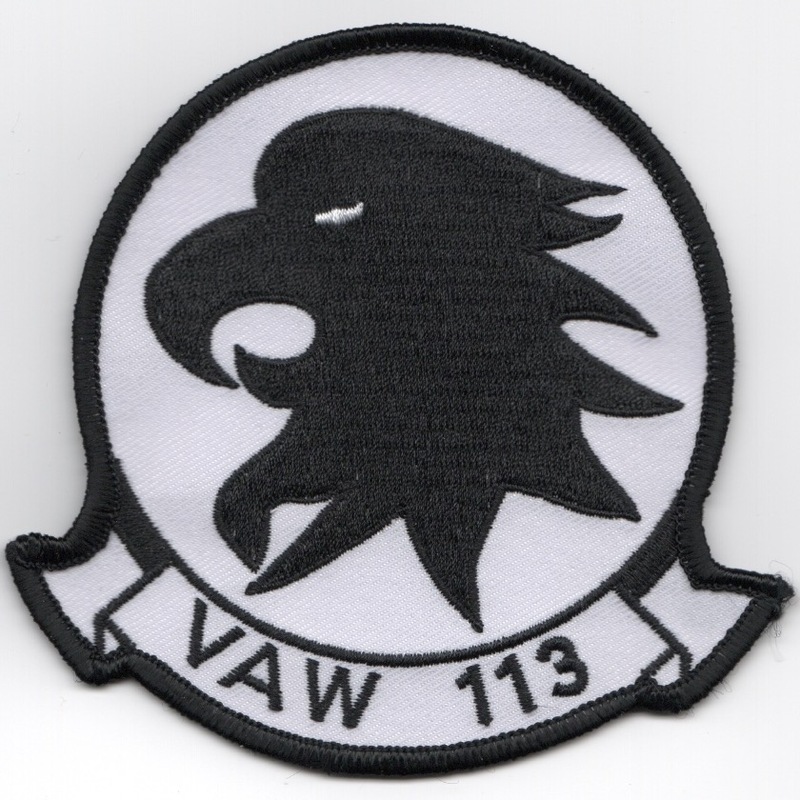 Homepage | Order VAW-113 Patches!